Posted by harrisb1 in Big Flats. Back in May we focused on Pop-Up books in the library collection. 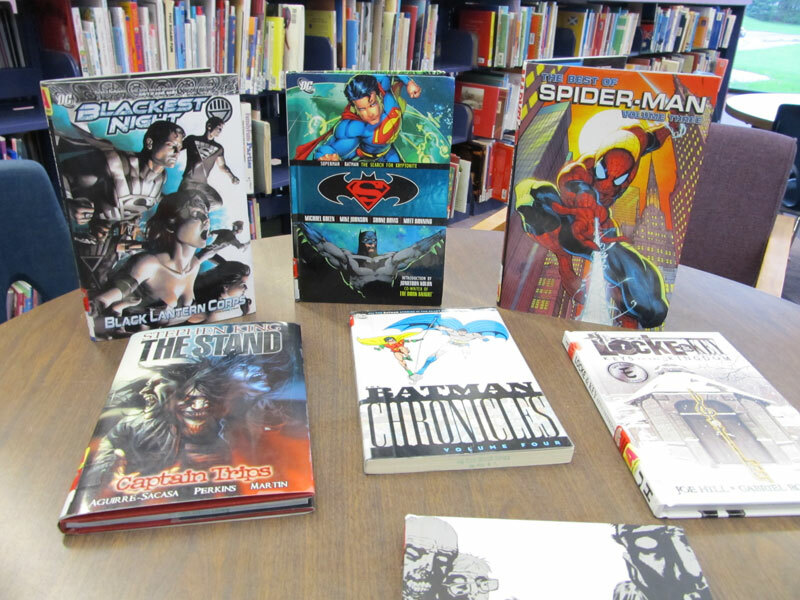 This entry, among other things, will focus on the Graphic Novel collection at the Big Flats Library. 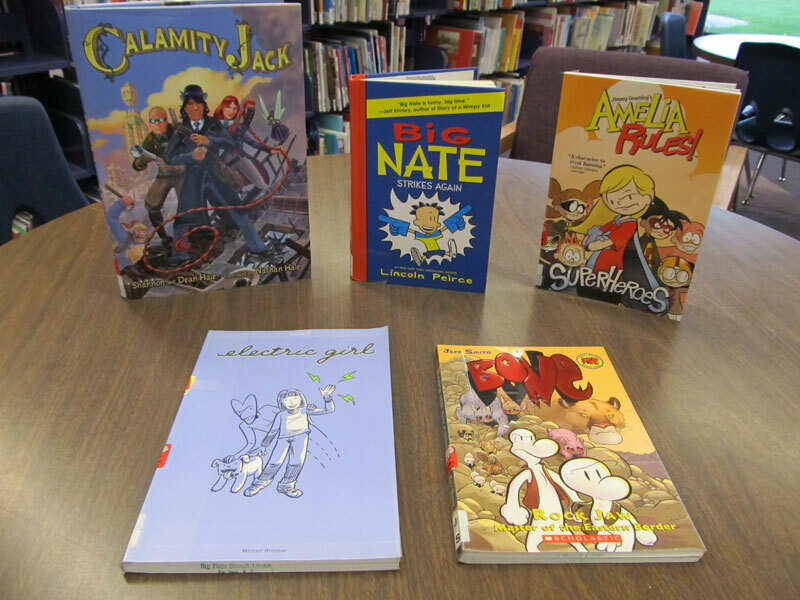 With both Young Adult and Juvenile graphic novel titles, Big Flats library is a little known hot spot for great graphic books. If this is your thing, come to the Big Flats library and take a look. 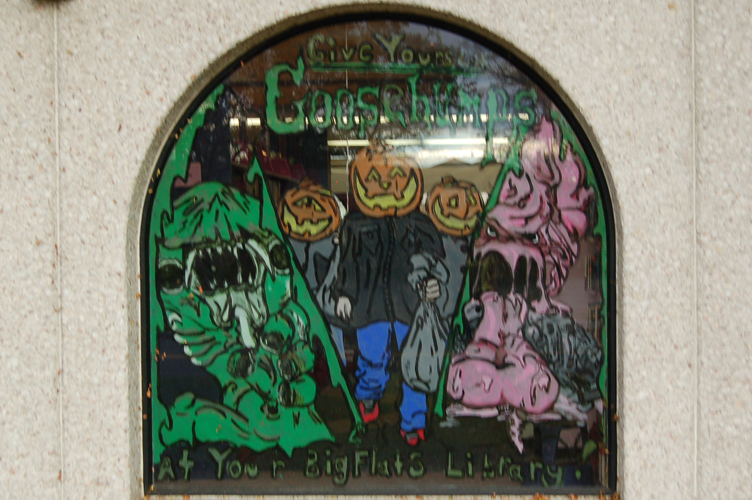 New window paintings at Big Flats. Local resident Justin Gregory and staff member Cassie Wright were painting again. Great job as always! Lake Minier (aka: Big Flats Library parking lot) is gone. A “tragedy” to local fisherman, A “miracle” for library patrons. Posted by corterc in Horseheads. 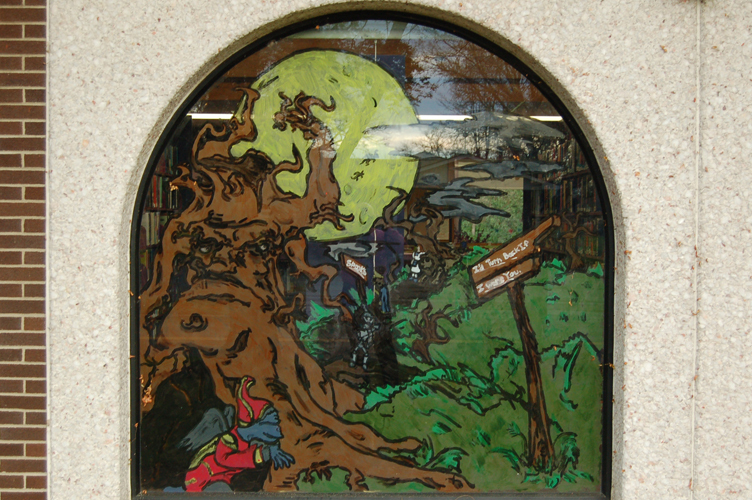 From 1988 – 2007, visitors to the Steele Memorial Library were treated to the kite artistry of Bill Connors. 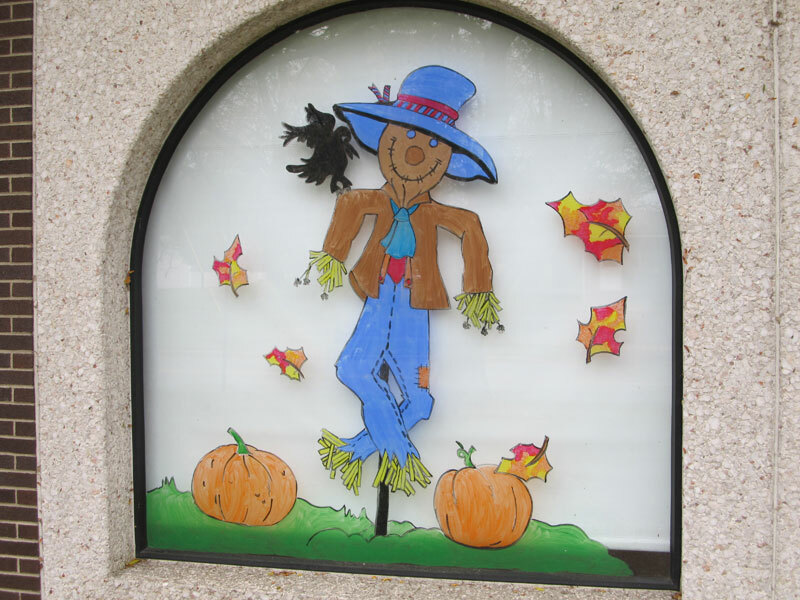 Now, Bill’s kites are flying high again in the Horseheads Library. Bill, a retired engineer who lives in Horseheads, spent his early retirement years constructing the kites based on traditional East Asian designs. The kites have been exhibited around the world, where they’ve won numerous prizes in competition. Bill gave many of his kites to the library to display so local area residents could enjoy them. With elegant tails strung across the children’s section, the Song Hong (meaning 2 sections) is reminiscent of early Chinese kites. The idea of mounting a smaller version of the main sail behind it may remind children of a baby bird flying behind its mother. The 9’X12’ Shirone kite is actually a scaled down version of the giant kites flown in the annual kite battle at Shirone, Japan. Bill’s inspiration for the dancing Indian design came from a copper plate found in Georgia. “Edo” is the old name of Tokyo. Bill’s Edo-Dako rectangular-shaped kite is one of the traditional Tokyo style kites. He based his design, however, on Michelangelo’s Piazza del Campidoglio in Rome. 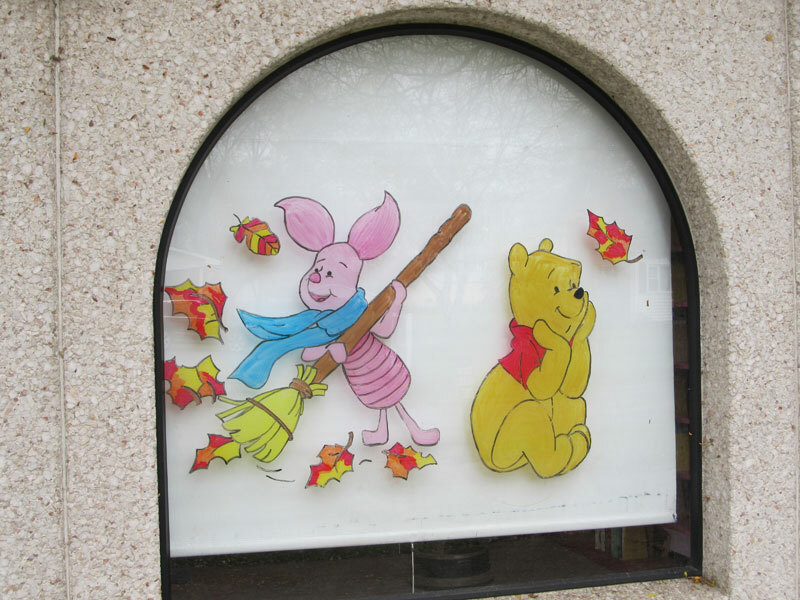 Come to the Horseheads Library to see the Song Hong, Shirone, and Edo Dako kites. If you want to know more about kites, you can also check out books such as Kites for Everyone: How to Make and Fly Them by Margaret Greger and The Usborne Book of Kites by Susan Mayes. Visit our Facebook page, to see more pictures of Bill’s kites. Posted by CCLD in Community, Steele, West Elmira. 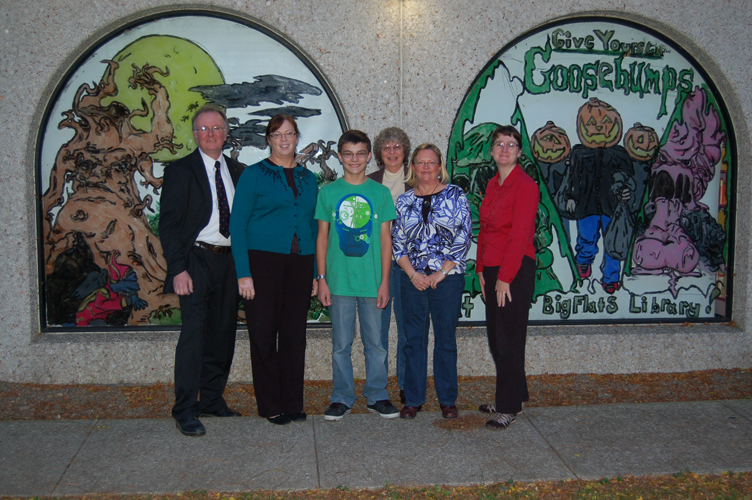 The ARTS Council of the Southern Finger Lakes (The ARTS), sponsor of National Youth Art Month in Chemung, Schuyler and Steuben counties, announced Monday that 29 classrooms and 26 businesses, libraries and art venues have joined together to display area student artwork throughout the three-county region. The student artwork will be on view for the rest of the month. National Youth Art Month emphasizes the value of art education for all children and encourages support for quality art programs. The ARTS and the local businesses and organizations listed below are honored to provide a forum for acknowledging the skills that are fostered by visual arts programs in our schools. A reception for students, parents and teachers will be held at The Gallery @ The ARTS, 32 West Market Street, Corning, on Saturday, March 19, from 12 noon – 2pm. 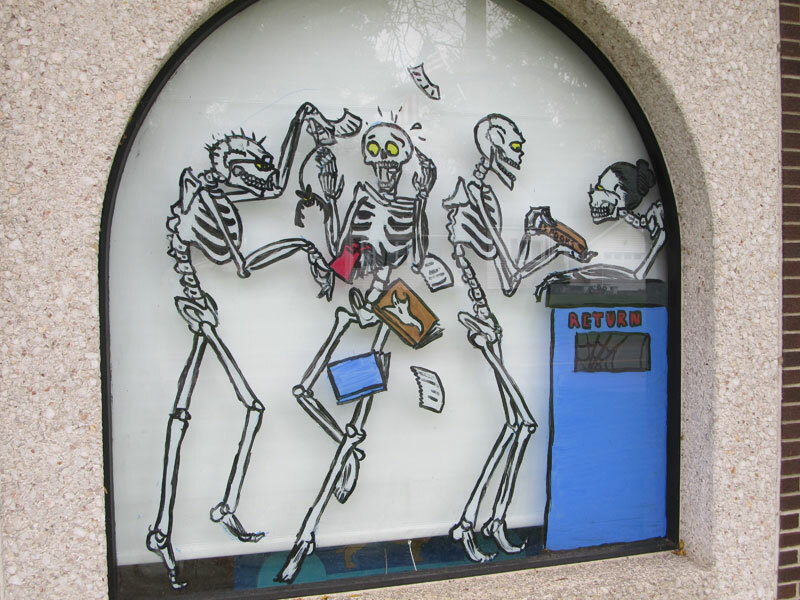 For information on NYAM installations in the Hornell area, please contact the Hornell Area Arts Council. The ARTS Council of the Southern Finger Lakes is the region’s arts services organization, serving artists, arts/cultural organizations, schools and the public in Chemung, Schuyler and Steuben counties of New York State. For more information, please visit www.eARTS.org. Posted by CCLD in Big Flats, Community. Justin Gregory has never been a fan of a blank wall. 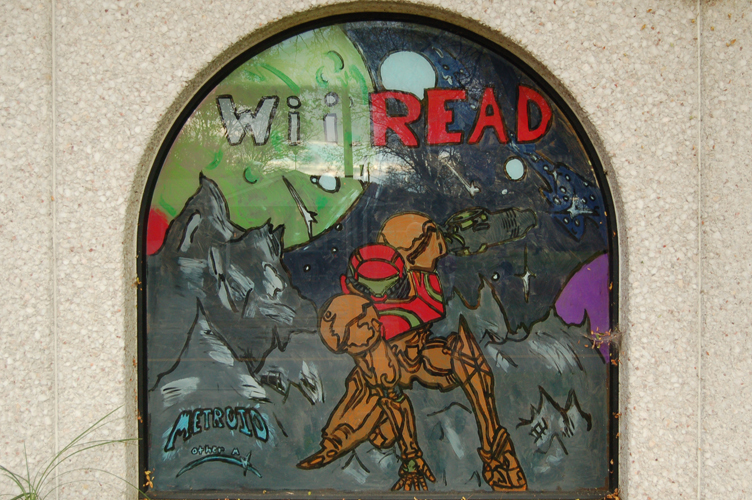 Now the Horseheads Middle School student has brought color and life to the windows at the Big Flats Branch of the Chemung County Library District. 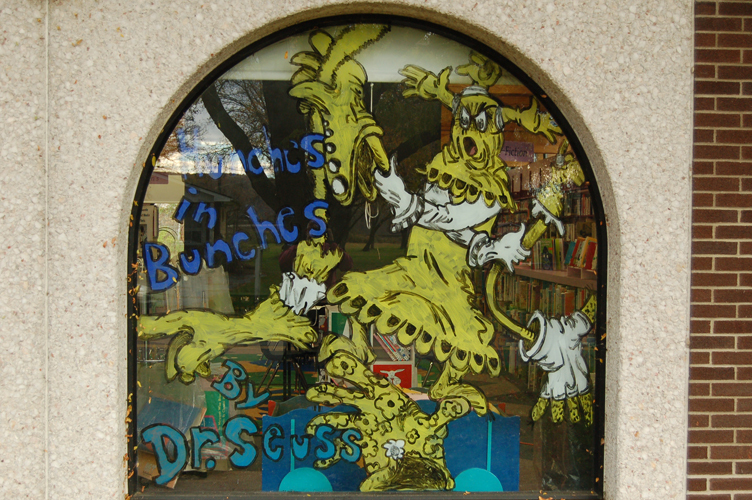 The window painting project gave Justin the opportunity to use a variety of themes, from Dr. Seuss to the Beatles, in ways that appeal to audiences of all ages.